You would have thought that I set a chocolate cake in front of my kids tonight when I pulled out a pomegranate, cut it in half and let them go at it. They picked out and ate the seeds until I insisted they got to bed. 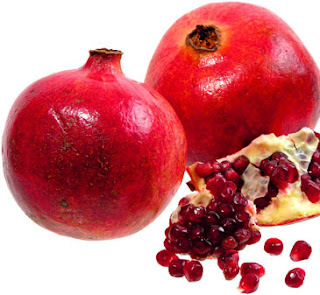 Easier than picking the seeds out of a pomogranate, drinking it's juice is not only tasty, but extremely nutritious. Pomegranates are full of vitamins(C, K, B), minerals and important antioxidants. The level of antioxidant is even higher than those of other fruits popularly known to have high levels of antioxidant, including blueberries, cranberries and oranges. This is attributed to the very high polyphenol content in the fruit. It may prevent and slow Alzheimer's disease. In one study, mice bred to develop Alzheimer's disease were given pomegranate juice. They accumulated significantly less amyloid plaque than control mice and they performed mental tasks better. One study showed that drinking 1.7 ounces of pomegranate juice per day lowered systolic blood pressure by as much as 5 percent. Since pomegranates are a seasonal fruit for us, I think that makes it even more special. My girls are starting to associate it with Fall along with pumpkins and Halloween. Try making it a special Fall treat for your family too! This is one fruit I would love to grow myself... You can sometimes find them in the supermarkets, but they are very expensive.